The first of hopefully many. It’s natural for this to come about, a “Person of the Audiophile Year” is here. The high-fidelity world is to love, to play, to learn and to give. We are also small enough to know each other. Most of us talk extensively at shows, and continuously afterwards. We get to know each other also through generous and gracious introductions, the way how businesses grow in sectors that people are more important than sales alone. So amongst many remarkable personalities, what singularizes this Person of the Audiophile Year? My root of reasoning guides me to give notice to a person who does not yield to superficial glory, but to hold steadfastly to the core values; a person who does not succumb to what others do rather only do what’s right. A person who won’t sell out. This acknowledgment is nothing more than a thank you. Thank you for going against the grain, thank you for doing it your way, despite the problems that this might bring to yourself. Thank you for fighting for music to be as good as it can be. Thank you for thinking of the people in this microcosm first. Thank you for taking everything into perspective, and not just the bottom number. So many Thankyous, but none as important as the Thank-you for being there for so many people. As with all businesses, high-end sound industry comes with its issues and its people, which in turn have their own challenges! We distinguish this Person for giving us the mature, honest, direct, and at times, courageous help. By being friendly, reliable, and has a persona which is stable with virtues that follow him wherever he goes. Lastly, the Person of the year in this high-end audio crowd, MUST be someone we can trust knowing that the music is above all companies. If something is amiss, he will and must say it, ego aside, we have to be subjective, to what is good and what is not. Frank started playing music at the age of 12, in a local fanfare in the North of Antwerp. At the age of 18 he participated at the European Youth festival for music in Munich, together with hundreds of other young musicians. 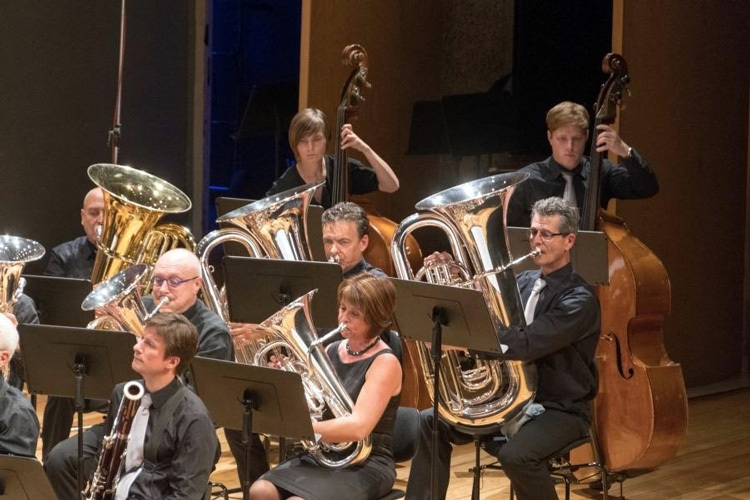 Today he still plays TUBA at concert band de Scheldezonen. After his chemistry studies in Antwerp he started working for BASF Antwerp, and in the meantime went back to evening school to study marketing & sales. In his free time he helped out at an Antwerp Audio Store called HiFi Corner. Nearly 20 years ago he quit the chemical industry and followed his hearth, joining a BeNeLux Distributor with brands like Jadis, Dunlavy, Rotel, Cardas…When the B&W Netherlands affiliate was formed he joined the Rotel – Classé – B&W group and learned a lot about international distribution and setting up a strong dealer network. While he followed his hearth to California when he was European Sales director for AudioQuest, their ways split and he got in touch with Synergistic Research. There he contributed to the growth of the company as EU Sales manager and managed their offices for about a year. When he returned to Europe he started Very Fine Solutions, a company dedicated to bring people together and distribute excellent audio products. Together with a network of friends and passionate music lovers in Europe he helped to build the SR and MSB brands and supports their distributors. His motto: MUSIC UNITES, and A GOOD AUDIO SYSTEM CONTRIBUTES TO THE QUALITY OF LIFE. Passion and love for music are key to bring the experience of music to people trough musical audio products. Frank doesn’t need a big ego to do his job, he helps people whenever he can and loves to make people happy when they hear a music coming to life on a system that’s been set up by him. From Abba to Zappa and lots of different styles in between. Early Baroque music for a Sunday morning and later on Anouar Brahem for a lazy afternoon with a glass of wine and …Rammstein while driving on any empty highway… ? His Dream: Contributing to the health of people by setting up boundless audio systems in elderly homes. He needs people to get moved by music, by feeling the artists close to them. Firstly bringing joy to these people and to fire up their brain activity so they stay healthier in mind and body. Votes taken by Personal Interview with audiophile reviewers, companies, colleagues. Twenty in total were received by Frank, runner up received 5. Open list and any possibility for any name to be included. There are no names mentioned before or after the interview (of subject been asked). No mention of score (to anyone) was given until these words are read online. Sample of 50 people were used. I have met Frank, once, in person. https://www.veryfinesolutions.com/wp-content/uploads/2016/12/Logo_VFS-1.png 0 0 Frank Vermeylen https://www.veryfinesolutions.com/wp-content/uploads/2016/12/Logo_VFS-1.png Frank Vermeylen2017-12-28 17:01:372018-04-24 15:34:28Frank Vermeylen, Audiophile Person Of the Year !